virtualpolitik: Do You Want the Bad News First or the Really Bad News? Do You Want the Bad News First or the Really Bad News? 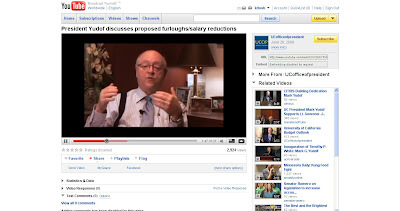 The YouTube video in which UC President Mark Yudof tells employees that they will face significant pay cuts or furloughs as a result of the state's budget crisis on the UC Budget news page has had both comments and embedding disabled, unlike Yudof's earlier, more positive video about the budget, which seemed to encourage bloggers and users of social network sites to post his message and disseminate it widely. It is also interesting to see how Yudof has refined his YouTube armchair rhetorical style, at a time when the mixed messages in the text-based PDF files of letters from individual chancellors on the ten campuses have been generating confusion and panic. Despite this multimedia campaign, employees are encouraged to give their feedback in the video to these draconian proposals only via the e-mail channel, so the simulated office intimacy does still feel to the recipient like a one-way communication. How ironic, given how movies used to seem so futuristic that would have a video message from a senior official to a government agent about the mission ahead, to see the use of this technology become so banal.